A rendering of the unique and powerful radio telescope. Image courtesy of VERTEX ANTENNENTECHNIK. On behalf of collaborators at institutions worldwide, the University of California San Diego recently signed a contract for the design and construction of a state-of-the-art millimeter wave telescope for the Simons Observatory. 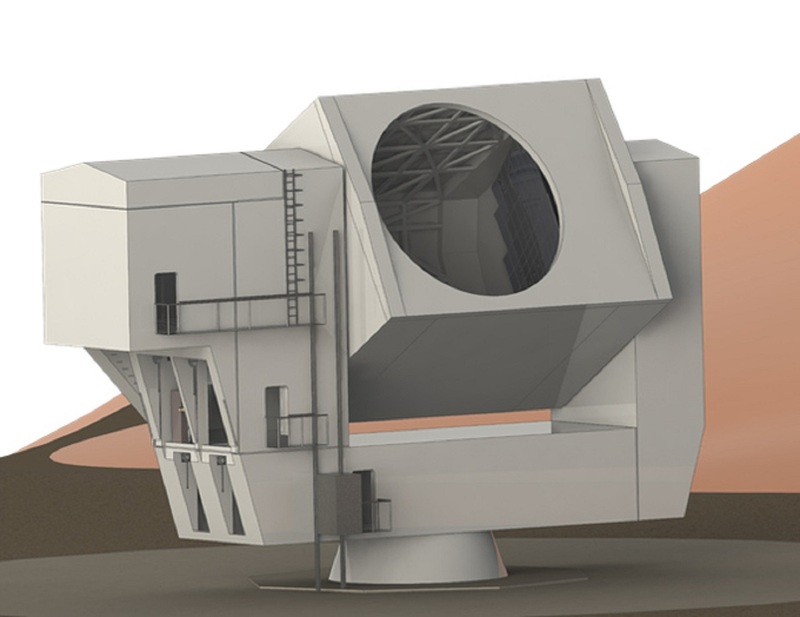 The telescope is the first of several which will be located in the high Atacama Desert of Northern Chile in 2020. At an elevation of 5,200 meters—or 17,000 feet—above sea level, it’s an ideal location to survey the universe. As part of the 35 institutions comprising the Simons Observatory, UC San Diego Department of Physics’ Professor Brian Keating and Assistant Professor Kam Arnold will have access to this instrument to study the Cosmic Microwave Background (CMB). Electromagnetic radiation left over from an early stage of the universe, CMB dates to around 400,000 years after the universe began, in the “Big Bang” cosmology. Sometimes referred to as “relic radiation,” CMB is important to study because it is the most ancient light there is, a pristine fossil of the earliest moments of cosmic time. Keating, Arnold and their nearly 200 colleagues hope to fully mine this cosmic treasure trove—from its broadest features to its finest details. According to Keating, scientists from the Simons Observatory team, including many undergraduates and graduate students from UC San Diego, will travel to the high Chilean desert site to gather data then analyze it over the course of several years. The new telescope will be designed and integrated by Vertex Antennentechnik GmbH. The enormous telescope will consist of two high-precision reflective mirrors with a 6-meter, or nearly 20-foot, diameter. The design will allow for a wide, clear field-of-view, with the ability to track objects across the sky with an accuracy less than 2 arc seconds—a unit of angular scientific measurement roughly the size subtended by a penny seen across 21 football fields. The telescope will be able to observe wavelengths of 1 to 15 millimeters, or .04 to .6 inches, where the faint cosmic signals are most prominent. The project is a major component of the Simons Observatory which aims to address questions about the origins of the universe—its contents, structures, the role of gravity and the nature of dark energy. The Simons Observatory is supported by the Simons Foundation, the Heising-Simons Foundation, UC San Diego, UC Berkeley, Lawrence Berkeley National Laboratory, University of Pennsylvania, Princeton University and University of Michigan. According to Keating, the Simons Foundation has long supported his and Arnold’s research since it funded the Simons Array, a precursor to the Simons Observatory in 2012. The Simons Foundation’s mission is to advance the frontiers of research in mathematics and the basic sciences. Its Mathematics and Physical Sciences (MPS) division provides funding for individuals, institutions and science infrastructure in these areas. Co-founded in New York City by Jim and Marilyn Simons, the foundation exists to support basic — or discovery-driven — scientific research undertaken in the pursuit of understanding the phenomena of our world. The Department of Physics is part of the Division of Physical Sciences at UC San Diego. The department is ranked #16 for best graduate programs according to U.S. News and World Report.